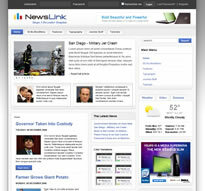 Shape 5 have released News Link, a new theme for Joomla 1.5 and 1.0 that is focused on news. In fact it's a good old content management system theme, focusing on the content. It comes with 23 module positions, loads of extra extensions included and a new one this month that allows you to display the news on the front page with up to six different layouts - it's a scrolling content module of sorts - but more can be read over at Shape 5 if you're interested. It's a really nice theme and makes getting a content focused news or information site up, really easy, in so much that the design is done for you - then it's a case of worrying about getting the content up. Naturally you get the source files so if you don't like the shading or the rounded corners you can easily change it and if that was enough, you get the support forum and loads of help from the community.